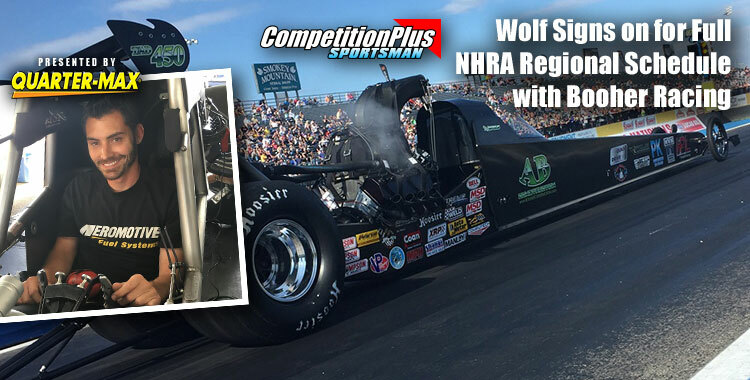 In the final results at the NHRA Lucas Oil Drag Racing Series, South Central Division, Nitro on the Bayou at No Problem Raceway Megan Meyer, Olathe, Kan., and Annie Whiteley, Grand Junction, Colo., took home the wins in Top Alcohol Dragster and Top Alcohol Funny Car respectively. Meyer was the runner up at this event in 2016, and came out strong this weekend as the number one qualifier who worked her way through the field and earned her second divisional win, and second win of the year. She had the starting line advantage and ran the quickest and fastest pass of the weekend for the final round win in 5.234 seconds at 279.67 mph. This victory was over Jackie Fricke, Flemington, N.J., who had a runner up lap of 5.307 seconds at 271.35 mph. Fans were in attendance as the Lucas Oil Drag Racing Series, Pacific Division hit the Strip at Las Vegas Motor Speedway this past weekend. Joey Severance and John Lombardo Jr. celebrated with their teams in the winner’s circle following their final round wins. Severance, Woodburn, Ore., defeated Buddy Domingue and Garret Bateman in rounds 1 and 2 to meet Chris Demke, Sunland, Calif., in the final round of Top Alcohol Dragster. Severance came off the line first with a great start, mounting a big lead leaving Demke little chance to chase him down. Severance registered a victory run of 5.290 seconds, 273.55 mph; moving one step closer to defending his Lucas Oil National Championship. Demke came in at 5.452 seconds, 269.67 mph. After a promising two-race campaign in 2016, Top Alcohol Dragster rookie Kirk Wolf has committed to running a full schedule of races in 2017. 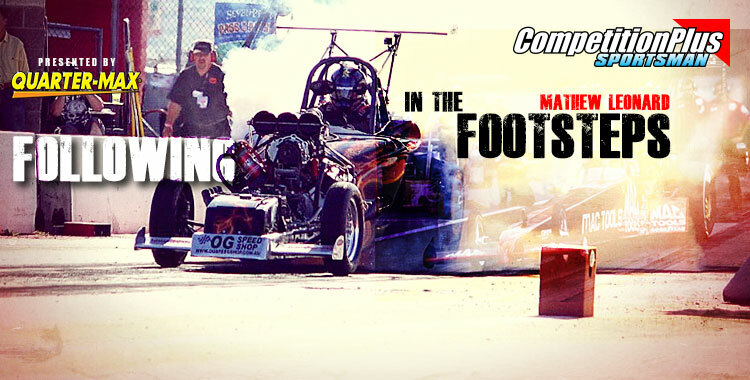 He will again get behind the wheel of the Booher Racing blown alcohol dragster for three national events and the full NHRA Lucas Oil Series North Central Region schedule, beginning with the North Central Region season opener in Indianapolis, April 28-30. John Labbous raced to his second win in as many weeks and his third of the season this weekend at GALOT Motorsports Park and the NHRA Lucas Oil Drag Racing Series, while Clayton Roberts took the win in the Southeast Division Stott’s Ford Top Sportsman class. 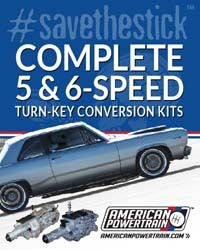 Labbous, White House, Tenn., drove his ’63 Corvette to the Super Gas win over division champion Steven Furr, Harrisburg, N.C., at 8.557 seconds, 146.53 and a .013 package to Furr’s 8.583, 140.78. Labbous opened the season with a win in Super Comp at Orlando Speed World Dragway and won last week in Super Gas at the Lucas Oil Series event at South Georgia Motorsports Park. It’s been anticipated by many for one year and it’s finally here; The K&N Spring Fling Million presented by Optima Batteries. The rigs will begin entering The Strip at Las Vegas Motor Speedway in expectation of what will be a very financially rewarding week. 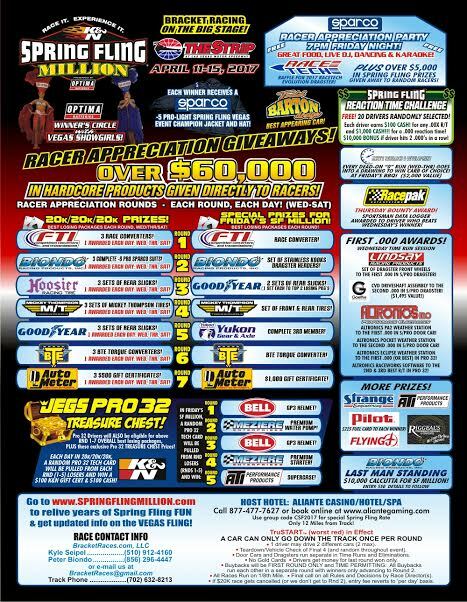 Beginning with a Free Test & Tune session sponsored by Yukon Gear & Axle on Tuesday, racers from all over the country will descend upon the track which last year saw Jeff Verdi win the main event, The Million, with his door car from Virginia. David Rampy scored the elusive double-up at this weekend’s NHRA Southeast Division Lucas Oil Drag Racing Series event at South Georgia Motorsports Park taking home the trophy in both Comp Eliminator and Super Stock. The veteran racer from Piedmont, Ala., worked his way through eliminations and lined up with Bobby Dennis, Shorter, Ala., in Super Stock for his first of two final rounds. Rampy took the early lead which proved to be the difference as he collected his fifth win in Super Stock on a hole shot running 10.152 seconds at 123.68 mph to Dennis’ 10.808, 124.45. Rampy would then face off with Randy Daniels, Grantsboro, N.C., in Comp Eliminator with his familiar ’32 roadster. Rampy again left first and crossed the finish line in 7.379 at 152.93 to secure the Double-Up and his 35th divisional win in Comp. 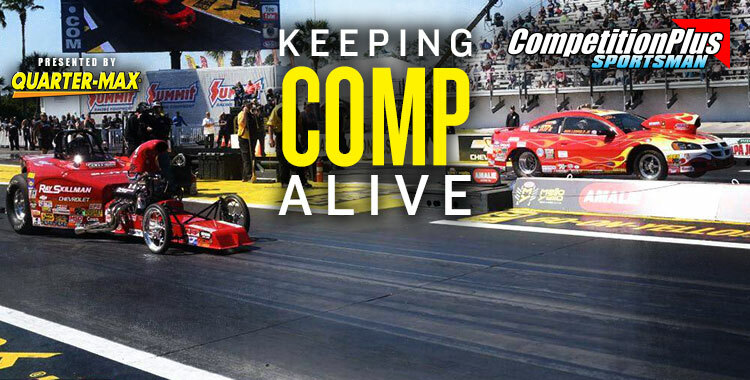 Life for NHRA Competition Eliminator racer Mathew Leonard is all about setting personal goals and achieving them. Like many racers in the sport, Leonard was also introduced to drag racing at a very young age. In the late 1990’s, Leonard made his way to the United States to help fellow Adelaide, Australia racer Robert Schwab in Top Alcohol Funny Car in 1996 and returned in 1999 when Schwab made the jump to NHRA Nitro Funny Car. After his experience with Schwab’s team, he was invited to go on the NHRA tour as a crew member with Kalitta Motorsports. Will Hatcher's A/Dragster Automatic is at the top of the food chain as far as Comp Eliminator classifications are concerned. Even Hatcher, a diehard Division 5 NHRA drag racer, will admit the food supply has been dwindling over the last five years in Competition Eliminator. Hatcher, along with a strong support system with the members of the Sportsman Racing Advisory Council are determined to save the harvest with an aggressive push to rebuild the ranks of the longtime sportsman racing division where drivers compete on a handicap system and no breakout. Texas racing was on full display as local racers; Clark Smiley and Joel Covington celebrated with their teams in the winner’s circle following their final round wins at the NHRA Lucas Oil Drag Racing Series, South Central Division, Texas Sportsman Challenge at Royal Purple Raceway. Smiley, Denver City, Texas, ceded the starting line advantage to Ray Goodman, Boerne Texas in the Comp Eliminator final round. However, Smiley was able to pull out the win, registering a victory pass of 7.343 seconds, 183.72 mph; Goodman runner-upped at 7.435 seconds, 179.06 mph. 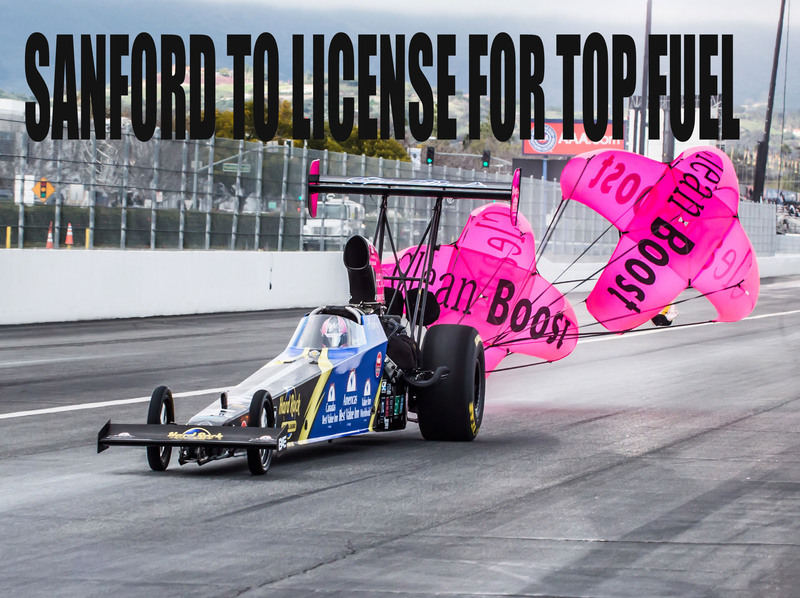 Top Alcohol Dragster driver Ashley Sanford confirmed to Competition Plus she will license in the Lagana family’s Top Fuel dragster April 3 at The Strip at Las Vegas Motor Speedway. This coming week – March 31-April 2 – the DENSO Spark Plugs NHRA Nationals take place at The Strip at Las Vegas Motor Speedway. Tripp Tatum will be driving the Lagana Family Top Fuel dragster in Vegas.